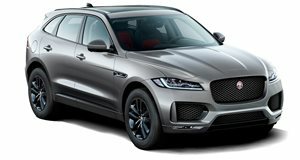 Meet the new and improved 2019 Jaguar F-Pace. First introduced in 2017, the F-Pace marks Jaguar’s first foray into the lucrative crossover market, and it’s already its best-selling model. For the 2019 model year, the F-Pace SUV has been updated with new tech, an updated interior, and a powerful SVR model. Of course, we’re already familiar with the Jaguar F-Pace SVR after it . If you need a refresher, the F-Pace SVR is powered by a supercharged 5.0-liter V8 that pumps out 542 horsepower and 502 lb-ft of torque. The result is an SUV with sports car performance. 0-62 mph takes 4.1 seconds before the SUV tops out at 176 mph. The F-Pace SVR also features bespoke suspension, aerodynamic enhancements and new lightweight 21 and 22-inch alloy wheels. A Variable Valve Active Exhaust system ensures the to match performance. Inside, the F-PACE SVR is fitted with sports seats featuring the SVR logo and a Sport Shift Selector. Also new to the 2019 F-Pace is the addition of Adaptive Cruise Control with Steering Assist to the range of safety assists. Operating between 0-110 mph, it uses the existing Adaptive Cruise Control with Lane Centering to steer the SUV within its lane while maintaining a set distance from the vehicle in front. Other features include Adaptive Cruise Control with Stop & Go that allows the driver to follow a vehicle to a smooth stop and resume from stationary when the driver prompts the system by tapping the accelerator pedal. There’s also a new radar-based High-Speed Emergency Braking system, which can apply the brakes up to 99 mph if an imminent collision is detected. As standard, the F-Pace now includes a Rear Camera, Front and Rear Parking Aids, Driver Condition Monitor, Emergency Braking and Lane Keep Assist. Inside, Jaguar’s Touch Pro infotainment with a 10-inch touchscreen is also fitted as standard, while new slimline sports seats featuring 14-way adjustment, adjustable bolsters and slimmer seatbacks are also available as optional extras. There’s also a frameless rear-view mirror, illuminated metal treadplates with Jaguar script, bright metal pedals, premium carpet mats, suedecloth headlining, chrome seat switches on the 10-way adjustable seats and carbon fiber door finishes. “The F-PACE has been critically acclaimed across the world and our performance SUV has more than 70 international awards to its name,” said vehicle line director Nick Collins. We have updated our best-selling SUV with improved safety technology, additional convenience features and enhanced interior comfort. All of these changes deliver the experience our customers expect from a Jaguar.” The 2019 Jaguar F-Pace is currently available to order in the UK with prices starting at £36,520 ($49,471).